FAMILIAR STYLE: Destiny is getting a lot of comparisons to Halo. 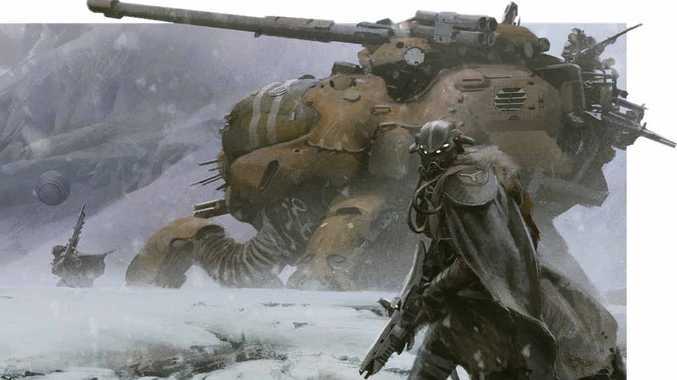 DESTINY is set to be one of the biggest games of 2014 and thanks to previews and an updated website we now have a whole bunch of new details about the upcoming Bungie title. The game is set on a post-apocalyptic Earth, years after the arrival of a mysterious alien artefact known as the Traveler. As large as a small moon, the spherical Traveler "breathed new life into our system," bringing rain to Mars and cleansing the sky over Venus. Unfortunately, just as the Traveler's arrival heralded a new Golden Age for mankind, an "ancient enemy" of the mysterious being arrived; "a powerful darkness that found us here on Earth and nearly destroyed us". It's all very mysterious and epic feeling - completely recognisable in its aesthetic to anyone familiar with the Halo mythos - and brings a number of alien species to Earth, scattering them around the last surviving human city - a walled citadel protected by the Guardians whose ranks you'll join as you begin the game. In terms of play-style, the game is quite expectedly getting a lot of comparisons to Halo (Bungie's previous title - you may have heard of it) with a first-person-shooter vibe supplemented by a range of magic and technologically-powered special abilities. However, it's in the game's mechanics and its range of play styles that Destiny will be differentiating itself from the competition. Writing in the Guardian, Keith Stuart describes the game as, "Halo enhanced with the looting and character upgrade mechanics of the Borderlands series then placed into an organic online environment where MMO elements are seamlessly injected". This is not to mention The Tower, the game's social hub where avatars mingle in third-person view to show off their customisations among bustling marketplaces which allow users to trade and upgrade equipment (those familiar with World of Warcraft will note the similarity). So far though, Bungie has only allowed for a closer look at the Strike mode, releasing a short seven-minute excerpt of these 30-minute mini-dungeons. Players will either create a team with friends or get matched up with strangers to fight their way through these contained arenas before taking on a boss for loot and experience. All these game types and more will be packed together to create what Bungie are calling "shared world shooter", a genre that it's possible to hype as a new departure for the FPS, but that really appears to be a mash of several well-established titles. There's Halo for the fighting style and the general feel of the world (a bit of industrial ruin here, some alien architecture there); Borderlands for the customise-your-way-to-glory approach to weaponry and armour, and World of Warcraft for the mix of open-world exploration and dungeon-like arcade encounters. The question is, will Destiny be more than the sum of its parts? Destiny's release date is slated for September 9 on PS3, PS4, Xbox 360 and Xbox One.